Pondering your retirement options? These up-and-comers haven't made any Top 10 lists yet—but they are poised for big things, and are already a boon to retirees. When it comes to the best places to retire, we’ve covered prettiest, happiest, and most affordable cities and towns. We’ve even covered which towns have a strong collegiate tie. Now, we’ve compiled some of the unsung heroes of retirement — those places that don’t always make the national top 10 lists but are a boon for retirees nonetheless. One thing to note is that many of the towns and cities we included are located in the South, specifically the part of the country known as The Sunbelt. Not everyone needs to retire someplace balmy, but we’ve found that the majority of people seek out warmer climates and are less inclined to want to deal with harsh winter weather, according to research conducted by TopRetirements.com. What’s more, many Southern states are veritable tax havens for retirees. Georgia, South Carolina, Florida and Alabama, for example, don’t tax Social Security benefits and have property tax breaks for seniors, according to Kiplinger. The key to remember, though, is that there are 76 million baby boomers in the United States envisioning their golden years in 76 million unique ways. So if none of these particular towns strike your fancy, let us know where you plan to retire in the comments section, and maybe you’ll see it featured in a future article on Grandparents.com. Known as “Rocket City,” Huntsville’s impressive history reaches beyond its city limits and — as the center of rocket-propulsion research and home to the U.S. Army Aviation and Missile Command NASA’s Marshall Space Flight Center — has a strong foothold in American past and present. Unlike more rural parts of Alabama, Huntsville has a sophisticated, city-like feel to it, said John Brady, President of TopRetirements.com. And as one of the top 30 fastest growing metro cities in the country, according to the 2014 U.S. Census, it also has a thriving economy, which means finding work after retirement is possible if that’s on your retirement checklist. Huntsville was added to the National Register of Historic Places in 1973 and has three historic districts. If a 150-year-old antebellum single family isn’t your speed, luxury condos, affordable apartments and eclectic lofts dot downtown Huntsville. Speaking of downtown, it’s also home to award-winning chefs, like Chef James Boyce of Cotton Row Restaurant, eclectic boutiques and even craft breweries (Huntsville is considered the epicenter of Southeastern craft brewing). With more than 40 event venues and a thriving arts scene that includes museums, a ballet and even a symphony, Huntsville residents have more than their fair share of cultural activities to choose from. Even its parks feature prominent gifts from around the world, including the iconic red Japanese bridge and cherry trees given to Huntsville by Japanese Major General Mikio Kimata. And when they’re not experiencing man-made beauty, residents take advantage of the town’s warm climate by experiencing natural beauty through hiking, biking, walking and even horseback riding through its nature preserve and wildlife sanctuary. If you thought living in Florida meant having to live at sea level, you’ve never heard of Mount Dora. At 184 feet above sea level, Mount Dora is considered one of the highest points in the Sunshine State. Centrally-located in Florida (about 45 minutes away from Walt Disney World), this charming lakeside retreat tucked amongst orange groves is home to the oldest continuously operated hotel in Florida and has a history steeped in hospitality and relaxation. As a former playground for wealthy Victorians seeking sun and leisure, Mount Dora’s Lakeside Inn hosted at least two U.S. Presidents in its heydey, who spent their vacations rocking on the great veranda, fishing in Lake Dora and taking in the picturesque oak trees and Spanish moss. Craftsman-style bungalows, Victorian-era single family homes and some decidedly Mediterranean influenced creates a storied patchwork of architectural styles that ultimately give Mount Dora a unique, eclectic feel. Once considered the “Antiques Capital,” Mount Dora’s shopping scene offers more than just trinkets and treasures from yesteryear. From privately-owned boutiques to full-scale shopping malls, Mount Dora is a shopper’s paradise. Situated across from rain-drenched Seattle, Sequim, Washington, is a veritable patch of clear sky in any otherwise cloudy sky. Thanks to a uniquely dry microclimate with temperate weather year-round — the mercury only rises into the 70s during summer and typically doesn’t dip below 40 in the winter — Sequim’s beautiful blue skies have been attracting pilots to settle here for three decades. Sequim’s lack of rainfall also creates the perfect climate to grow lavender, making it the Lavender Capital of North America, rivaled only by France. This Pacific town is also home to another tasty cash crop — Dungeness crabs — which are harvested nearly year-round from November to July. Nestled between the snow-capped Olympic Mountains and Salish Sea, Sequim residents have access to both land and sea adventures. Its sunny weather also make it a terrific golf destination. There’s even a crab-shaped sand trap in homage to the Dungeness crab. If outdoor recreation isn’t your thing, Sequim has a thriving cultural scene and is only a two-hour drive to Seattle (day trip!) or a 30-minute drive to Port Angeles where you can hop the ferry to Victoria, British Columbia (just don’t forget your passport). It’s also home to Olympic Cellars, one of the first wineries in Washington State and the first to operate in the Olympic Peninsula. There’s gold in them Georgian hills! Seriously. Dahlonega, Georgia, was the site of the first major gold rush in the United States, not California. There may not be any gold left there today, but there are plenty of things to catch your eye in this quaint town, like the gorgeous lakes and waterfalls found throughout the area, stately Georgian brick architecture or the rolling Appalachian mountains that sit to the west. Dahlonega is also considered the heart of Georgia wine country, which is known for its sweet Muscadine, Merlot and Viognier wines, among others. Even though it’s still an up-and-coming wine region, Georgia’s soil composition has been compared to Italy’s piedmont region, which may one day yield prominent wines. As a college town — it’s home to the University of North Georgia — Dahlonega is a bustling cultural center with arts and live music, festivals and plenty of history. It’s been a Tree City USA community for 17 years running and boasts an historic downtown with plenty of shopping and dining, walking tours, theaters, and even ghost tours. The Chattanooga Choo Choo may be an old time favorite, but there’s nothing old about the cultural revolution happening in this Tennessee town. With an across-the-board redevelopment that spans from the heart of its downtown to the river’s edge, Chattanooga is having quite the renaissance and has turned itself into a desirable retirement destination. What’s more, with a low cost of living — 12 percent below the U.S. average — and no state income tax, the state and local tax burden are the third lowest in the country, making it an affordable place to retire. With a bustling arts district, prime dining locations, prominent museums, including the Bessie Smith Cultural Center, historic buildings, battlefields and neighborhoods, and an aquarium to boot, Chattanooga has a little something for everyone. 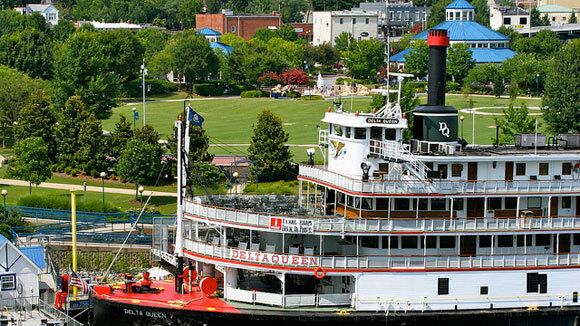 Chattanooga even has its own floating hotel — the Delta Queen — a steamboat that’s considered a National Historic Landmark. Chattanooga’s relatively mild climate — it can get humid in the summer months — also allows for a very active outdoor community, who swim, boat, fish, run and even hike throughout the surrounding state forests. To the west of tony Hilton Head Island is Bluffton, South Carolina, a Lowcountry town on the rise. Over the past 20 years, Bluffton has become less of a local secret and more of vacation and retirement destination thanks to its beautiful natural surroundings and relaxed way of life. Named for the scenic bluffs that overlook the May River, Bluffton has become a cultural powerhouse with art galleries and antique stores lining Calhoun Street. It’s also a foodie’s paradise with award-winning restaurants serving Southern delicacies, like fried green tomatoes, shrimp and grits and she-crab soup. For history buffs, Bluffton’s downtown is chock full of civil war-era antebellum homes and grand churches listed on the National Register of Historic Places. If you venture only 10 minutes from the heart of town, you’ll also found Rose Hill Mansion — a once-abandoned gothic revival plantation on the banks of the Colleton River. What really defines Bluffton, and the rest of this highly desired area, is what’s called Lowcountry living, which is truly something to behold. Great food, good friends and a fantastic porch — with a passing breeze or two — will help get you on your way to living the Lowcountry life. Taking in the scenery, whether it’s from a cozy spot on your porch or in a kayak or boat, is another perfect way to relax and unwind while marveling in this area’s natural beauty.